So back in January of 2007 I ran down the hill in the background of this photo and jumped off the wood wall. The problem with this was I thought the wall was only a couple of feet tall. As you can see I was wrong. Hence the resulting broken foot. Come to find out I had fractured my Lisfranc Joint and would spend 6 weeks in a cast up to my knee. 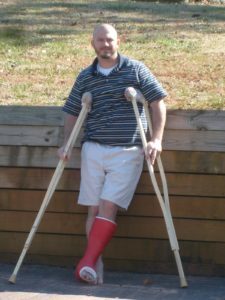 Almost 2 years after my broke foot I woke up one night with the most extreme pain in my right shoulder, arm and hand. Went to the Dr the very next morning and they said I was having a series of severe muscle spasms. Well after a couple of days of these excruciating spasms the general practitioner finally sent me to an orthopedic specialist. As luck would have it I already knew a good one from my broke foot. That Dr ordered an MRI and the resulting image is to the right . 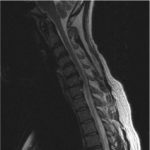 The image above is an MRI of my cervical spine. Notice the thick white tube looking thing in the center of my neck is my spinal column and towards the top of the spinal column you will notice that it has been pushed in and is pressing on the spinal cord. This was causing my entire right hand to be cold and numb. Now the Orthopedic Dr made the recommendation that I seek the care of a neurologist Immediately ! So we made some phone calls, did a little research and found an excellent neurologist. A couple months and a few thousand dollars later surgery was determined to be my best bet. By now I was losing muscle strength and the numbness was not going away. The Dr advised me that if we did not do something soon I could be facing severe & permanent nerve damage. 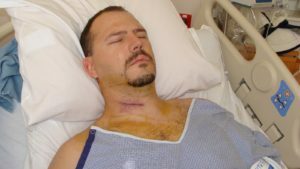 So in early October 2009 the Dr successfully completed an Anterior cervical discectomy and fusion (ACDF). Which is another topic for a later time. The result of my surgery was a complete success, I now have about 97% feeling back in my hand and no muscle spasms. As for an additional bonus, now I have a Titanium plate & four titanium screws placed on my spine. Ok, Now on to the good stuff and really the Meat and purpose of this blog. Fast forward time to 2010. At some time in the 1st quarter i started feeling really bad. My body was not co-operating with me, I hurt all the time and I could not move without my joints creaking and cracking. And not to mention that I had become FAT ! I mean really, my Size 38 pants were getting to small on me? WOW !! So me being 100% Type A personality decided that it was time for me to get back into shape and start exercising. For the first couple of months just going to the gym every week day at lunch was enough. I was burning calories and dropping some weight. Right about this time the P90X fitness program came on the scene then the Insanity program appeared. So I grabbed onto the Nutrition Guide for Insanity and started following it to the letter. Also, me and a friend started doing the Ab Ripper program from the P90X. I did all this and was still doing the cardio workouts at lunch. Finally the pounds started melting away. I went from 207 lbs to about 195 in four weeks. In the following weeks I added in some strength training on Monday , Wed & Fridays after work. Fast forward to July 2010. Now that I am eating correctly and exercising I have dropped all the way down to 177 lbs. Ab Ripper, Plus Cardio X, Elliptical at lunch & strength in the afternoons. Somehow my body had adapted to all of this and I have hit a wall.